They sat down together by the pool (look at Sandra’s awesome swim suit!). They actually had a great time. Nancy told Sandra about how she just wanted to be a writer and that everyone misunderstood her – poor Nancy. But Sandra didn’t judge her and was really intrigued by the stories ideas Nancy told her about. I think they somehow involved a unicorn and a dinosaur. The goofball in Sandra was called and she also told Nancy lots of goofy stories. 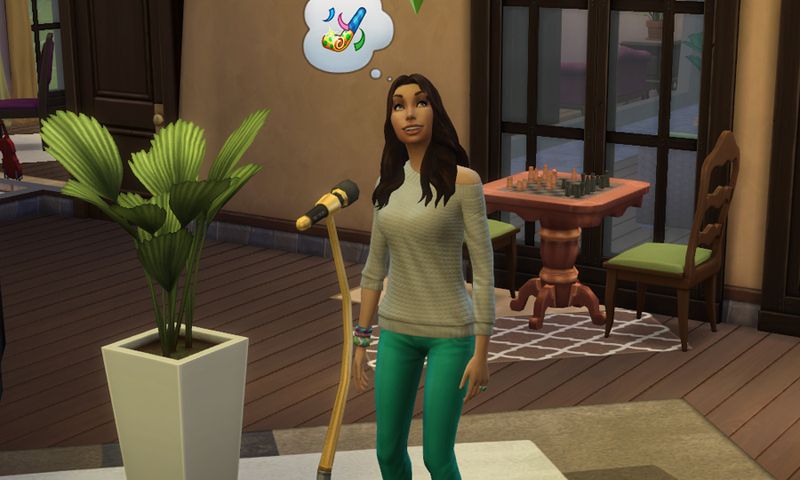 Nancy laughed at everyone of them and in the end, Nancy Landgraab became Sandra’s first friend! Sandra also increased her comdedy level by talking to her and that gave me an idea for later. But then I wanted Sandra to pratice some chess and her needs were also low so Nancy had to go. 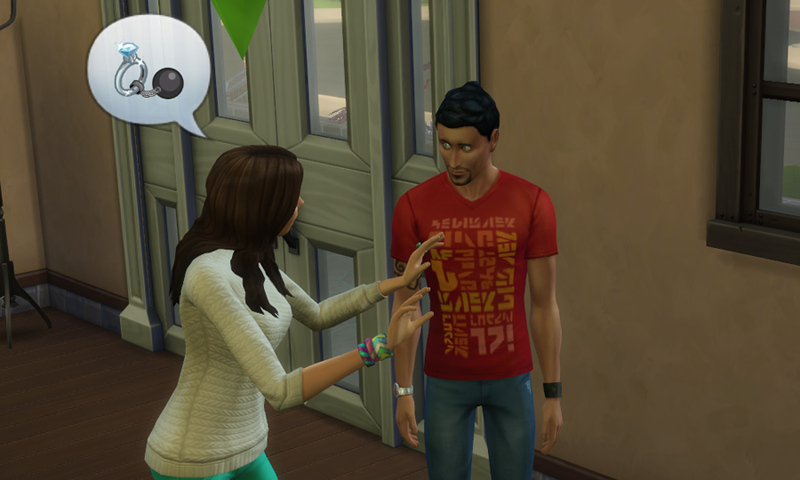 It’s funny, how shocked the other sims look when they are asked to leave! Makes me think that Sandra told her a floppy excuse about some relative who was involved in an accident. Come on Sandra, you can do better. Remember, when she watched comedy on TV and was kind of bored? 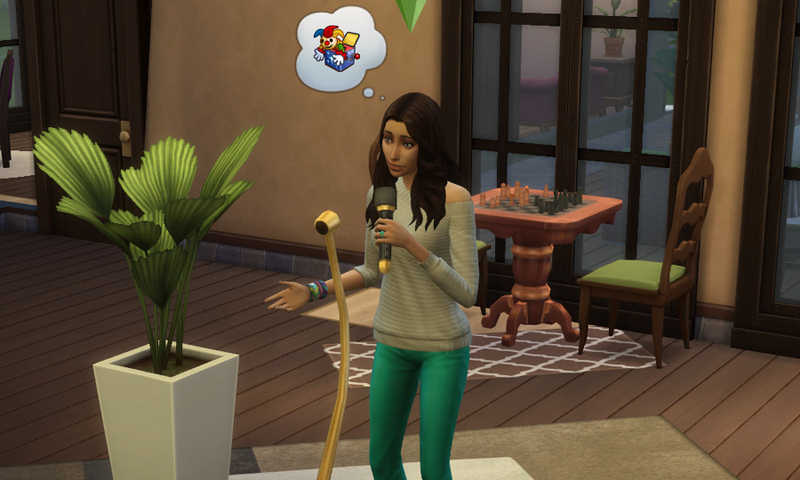 Well, I totally forgot about the chess (plum me) and thought I would give Sandra a go at the mic. Maybe she could do better than the TV guys. It started off really well but then she began to stammer and hide her face in her hands, as she tried to think of cool jokes. Not as easy as she would have thought! 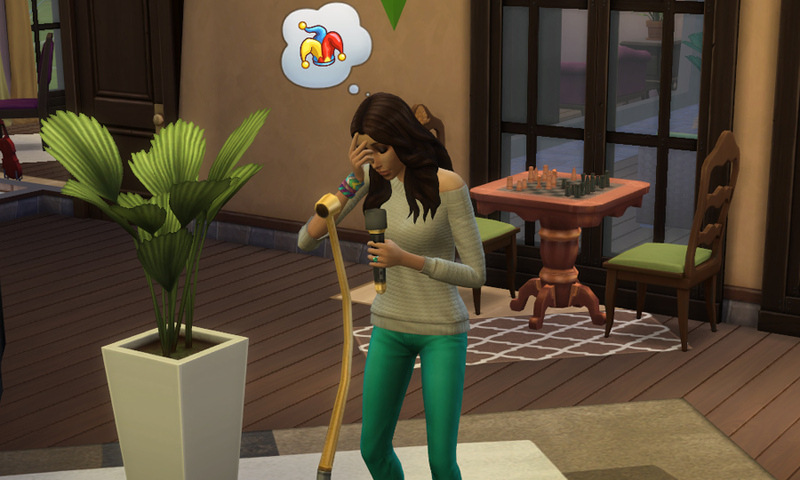 She even hit herself in the head with the mic at some point! Maybe that would make the audience laugh. There was no audience, but I sure did laugh! I’m also pretty sure she said the word ‘plum’! That’s it, Sandra, enough comedy for today. We do not tolerate swearing in this household! She looked really happy when I canceled the ‘Tell jokes’ action for her. Alright, so Sandra needs 2 more friends for her aspiration and also rolled the whim to make a friend! This is “Learning German with July and her sims”, live from the Muffin household. 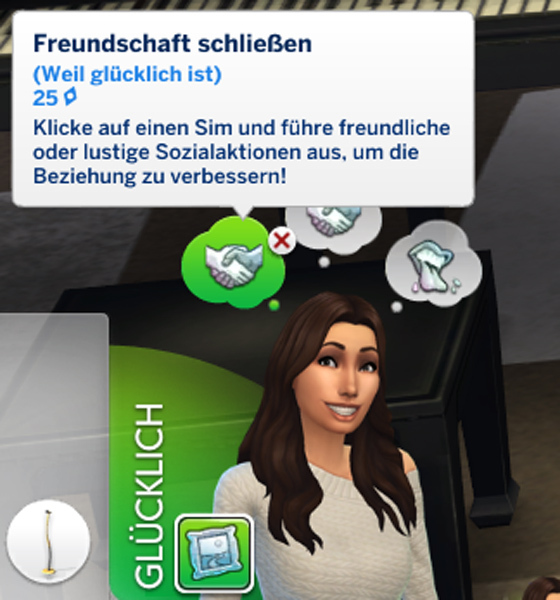 The emotion is “Happy” (obviously) and her whim says “Make a friend (because is happy) click on a sim and perform friendly or funny social interactions to improve the relationship”. Okay, for real, I can’t figure out how to switch the language to English without reinstalling so you’ll learn a bit of German from my UI captures along the way. Hope you don’t mind! Where was I? Oh yes! 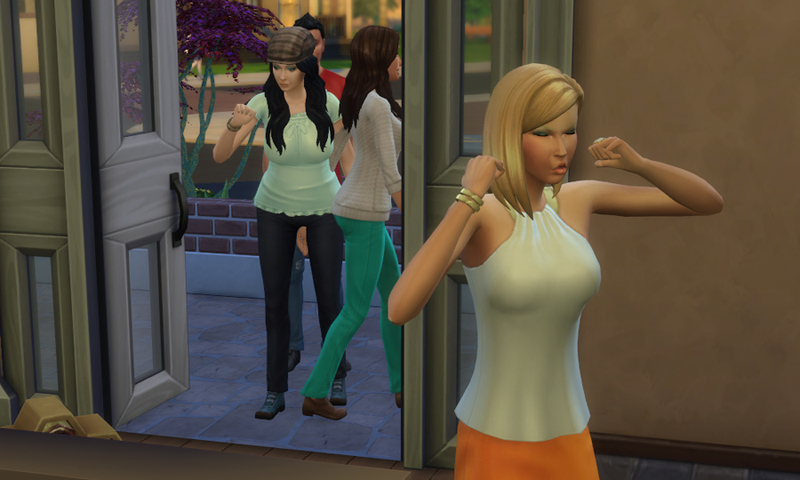 Sandra invited over Don Lothario, Nancy Landgraab and Laura Stevens, the doctor. Nancy is already her friend but I thought it wouldn’t hurt. Oh how was I wrong. Nancy arrived angry! I think she realised that Sandra’s story about the dying relative earlier was just an excuse to get rid of her. So she went off to the purple computer to troll teh forums (I think this is the new Bicblock) and stayed there for the rest of the visit. Come on, Nancy, Sandra didn’t mean it! Since Nancy was angry, I let her stay at the computer and engaged Sandra into a conversation with Don and Laura. Don was feeling very confident. Hey there, Don, don’t get any funny ideas! It was not a flirt though. But Don was so attentive to Sandra the whole time. He couldn’t get his eyes of her even when she was talking to Laura. 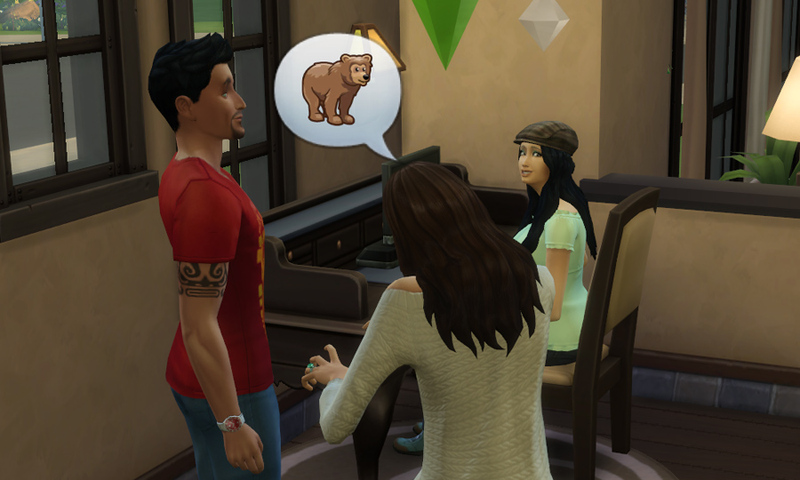 She told Laura a crazy story about a bear in Granite Falls and Don didn’t mind her goofiness at all! Sandra also rolled the whim to hug someone, but I chose Laura because the option didn’t show up with Don, I suppose she really didn’t want me to make her hug him. Just look at the way Don looks at her! So sweet. Or just serial romantic thinking. Who knows. They haven’t flirted with each other yet and Sandra has no whims to do so, so we wait. Ha! Sandra has Don all figured out. She knows about his non-committal ways and she won’t fall for his charm oozing. But Don still talked to her in a friendly way afterwards so I believe they can really be friends. Nonetheless, Laura Stevens became Sandra’s second friend, and as I wanted to befriend Don he turned his back and went off to the pool. Rude. I wanted to ask them all to leave because Sandra had to go to work (forgot to play chess again, darn) but they all left autonomously. How convienient! Stay away from Don. I mean, he’s calculating and very, very patient. So, you could think he’s your friend and start feeling attraction. He’ll use it and then toss you to the curb. Beware, Sandra. Beware. Nice to see Sandra making new friends. Better watch out for Don as he’s non committal. 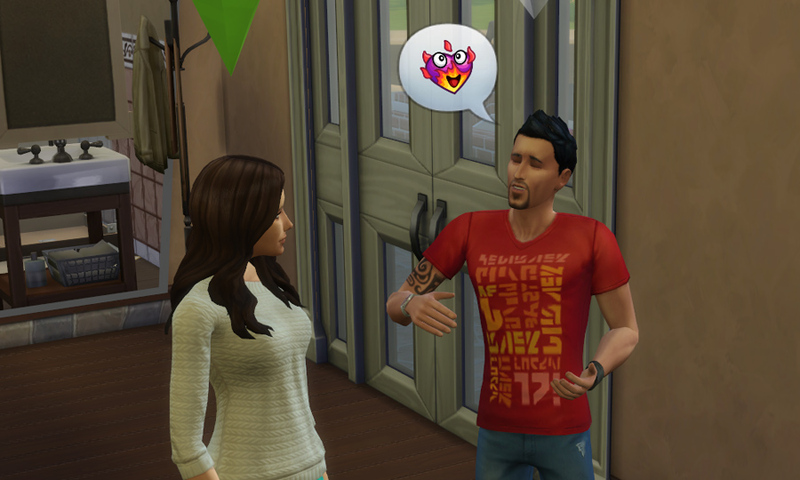 He will flirt for a while and then break a Sim’s heart in a matter of seconds. 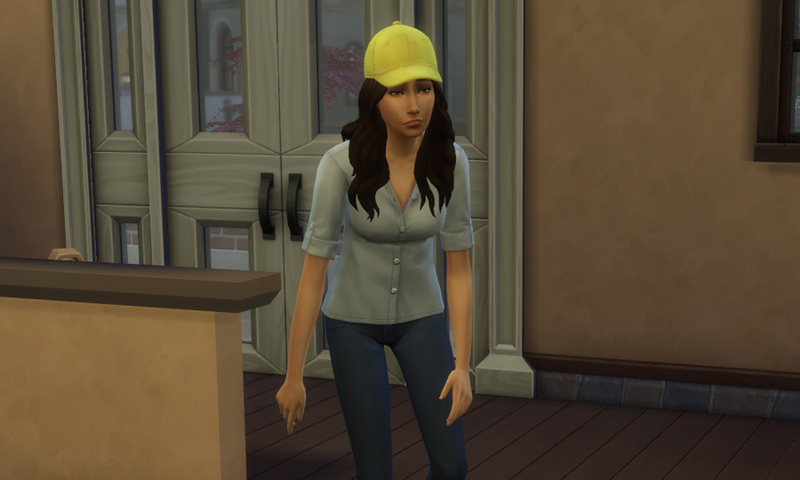 Nice chapter and I will have to admit that Nancy is much better looking in Sims 4 than 3. Glad that Sandra is making new friends and she’s got the right idea about Don as you have to watch out for those non-committal types as they will flirt one minute and break a Sim’s heart the next. So, I can’t deny that Nancy Landraab is pretty? Yes. I. Can. Don is such a womanizer but I have always had a sweet spot for him. He is being so cute with Sandra here ❤ Nice update! I loved the German lesson. That made me smile. Thank you! I really love that we have mini-German language lessons! I totally don’t mind seeing the German UIs and whatnot. 🙂 Thanks for taking the trouble to teach us some words! Aw, poor misunderstood Nancy! I hope she’ll calm down from Sandra’s dismissal soon. It’s not personal, Nancy! You don’t have to troll the forums and scare off nice people there. Eeeeeee! *squiggles* I added them after it had been months and months and I realized how wrong I was. Things didn’t always go as expected, haha!